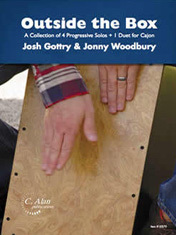 Outside the Box (by Josh Gottry & Jonny Woodbury) is a collection of four progressive solos and one duet for cajon. Each piece is intended to develop comfort with a variety of sounds and to assist the performer in creating a vocabulary of idiomatic and creative grooves for the instrument. Included are program/performance notes for each piece, a instrument key and diagram, and five recital appropriate works for cajon. Pocket Full of Rocks is an excellent introductory work combining rock, hip-hop, funk, and shuffle grooves into a medium-easy solo. Box Tops incorporates additional sounds (knocking, sliding, fingertips) in a mixed meter rock feel. Oxidation expands the sound palette, especially in terms of footwork, in a medium-advanced solo. Combinatorics utilizes traditional Peruvian rhythms, additional implements, and extensive independence between limbs in an advanced work for solo cajon. Slide Rule is based loosely on a Brazilian baião and exploits many of the different elements featured in the solo works, but in a longer piece that allows like-minded individuals to enjoy performing together. Make sure these pieces groove and the audience is inspired to go find themselves their own musical box! Printed by permission of the Percussive Arts Society, inc.